Landing aboard the Tahoe Flyer. Hot Air Balloons photo. You may have seen a colorful balloon drifting magically over Lake Tahoe during the early morning hours. It's hard to judge the size of the balloon, but actually it's large enough to carry 12 passengers. Lake Tahoe Balloons company launches between 5:00am and 7:00am when the visibility is good and the wind speeds are low. 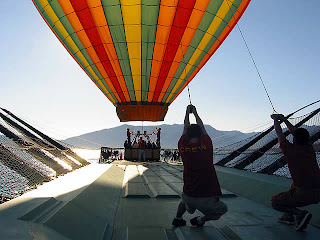 Lake Tahoe Balloons is unique because they launch and land balloons from their own two deck vessel called the Tahoe Flyer. The Tahoe Flyer is the only certified balloon launch and recovery vessel. It weights 21 tons and measures 120 X 22 feet on a catamaran style deck. The upper deck is for recovering the balloon and the lower deck is for passengers. The envelope of the balloon is made of heat resistant polyester. The envelope receives heat at the bottom through a small opening, and has a large deflation port in the top for opening during landing. Heat is provided by a propane burner with hoses to fuel tanks. The fuel tanks and people ride in the gondola. The gondola or "basket" is made of wickerwork rattan, and attached to the envelope by cables or a rigid structure. A hot air balloon provides excellent views of the lake and surrounding mountains from a quiet and seemingly motionless platform. Things get a little noisy when the burner is lit for gaining altitude, but you get use to the noise.